Because our prices are so competitive our customers are happy to turn us out to the simplest of repairs at the roadside that might otherwise get put off until the truck returns to base. But by just the same token no job is too big for Bowers Threeways either. 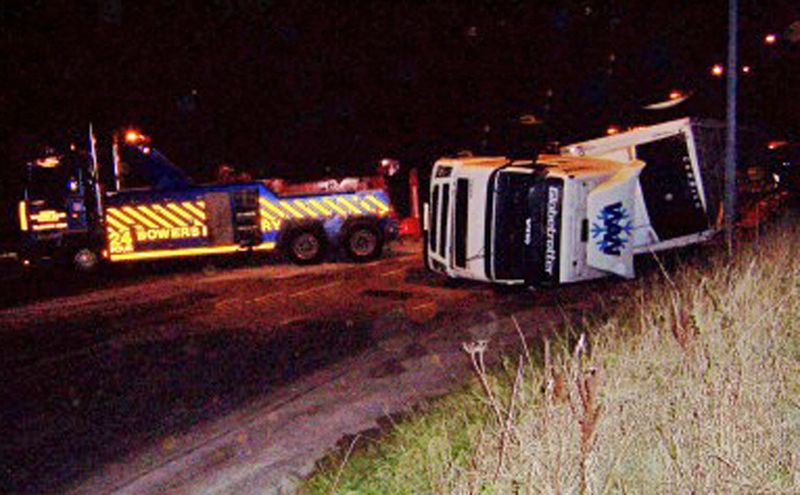 So when a road haulier had a spot of bother negotiating a roundabout Bowers Threeways was called in to do the recovery. The fully freighted 44 ton articulated was on route to a supermarket distribution centre loaded with bananas...'was' being the operative word. Bowers team attended with two heavy wreckers and the air cushion recovery unit and had the truck righted and load salvaged in under two hours.